Today I wanted to talk about character designs and work on the grydscaen: A Storm’s Coming anime episode 2 as we are coming up on the first rough cut of the episode being done. In this blog post I wanted to focus on how a character comes to life from original concept sketch to the lineart character design to the final character design in colour. We will be using the character “psychic killer” from the A Storm’s Coming anime to demonstrate how we bring this to life. A Storm’s Coming is a short story from grydscaen: tribute and an original manga written and illustrated by Natsuya Uesugi. The story is a murder mystery and focuses on the strained relationship between the homeless teen Rom and the Zone Police officer Xander Storm whose wife and son were murdered by a psychic killer who is stalking Rom. The story is full of suspense and the A Storm’s Coming short anime series is planned to be a five episode adaptation of the manga story. The first episode was completed last year and a trailer is available on YouTube on the Natsuya Uesugi channel. The animation is based on the manga but because there need to be more scenes for the anime we needed to finalize character designs. Lets focus on the psychic killer which is one of the main characters in the story. The first appearance of the psychic killer in drawings is in the manga. He does not have a full body pose in the manga until we get into the later chapters where he is attacking Rom. 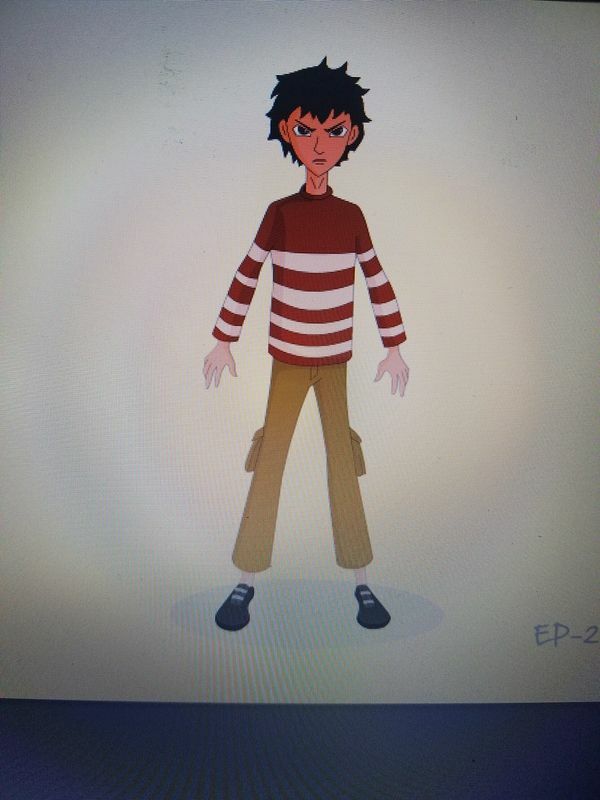 We are currently working on animating chapter 2 for the episode 2 which required that we have a full body character design. 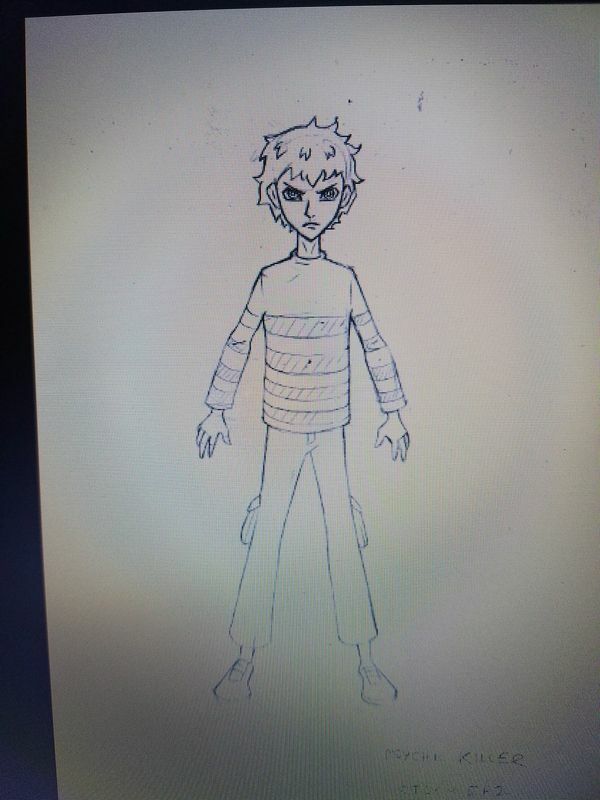 The character design was drawn in about ten minutes and the basic idea about what the character was wearing and how he looked. The psychic killer who is not named in A Storm’s Coming is actually named and given a large part in the grydscaen book The Seal Maker which will come out later. The killer’s name is Akira Yamaguchi and he is the elder brother to Satoshi Yamaguchi the environmental terrorist and the younger Hiro Yamaguchi the bio hacker. The concept art shows a side and front view as well as gives some description about what the character is wearing. There were some initial questions from the character designers for the clothing once we got into the colouring stages but that came later. The character has large eyes which can be expressive and I wanted to make him look sort of angry. This anger will come out more in the anime rough sketch. 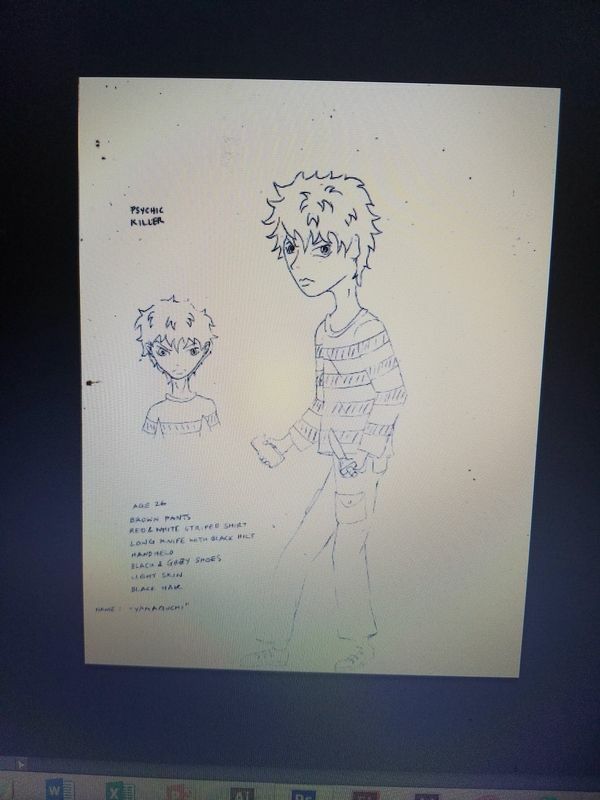 The original concept art was provided to the animators and the design team worked on the lineart character sketch for the anime based on the concept art. As you can see there are a few subtle changes in how the character looks with the stripes on his shirt and the pockets on his pants being lower. The character’s eyes are still large and his expression is more angry. The basic design is the same as the concept art but it is rendered more in an anime style which will be used in the episode. Once the lineart was signed off we went into working on colouring the character. There were a few iterations of the colouring as the stripes on the shirt in the original colouring were backwards. Since the original concept art had details about the colouring there were only two passes that needed to be made before the colouring was correct. You can’t see it in the photos taken off the computer for these images but you get the concept, apologize for the poor photo quality. So all the character designs for this episode are in. There were three new characters introduced in this episode: the Zone Police captain, the psychic killer and Zone Police officer 1. These all needed to be designed and coloured based on the characters in the manga. Since the manga is in black and white, I needed to work on how the characters would display in colour and all these decisions had to be made to finalize the characters. Character sketches were done for each in the same manner as the above. Backgrounds are completed and coloured and animating has started. The team is in the first round of cleanup and there will be a rough cut available in the next week or so for the art director to review and add comments, request changes. All in all the process is going smoothly. This episode is going traditional and is a little different than the last as it has more action. Traditional animation requires additional time to complete. Hopefully I will be able to review something soon. Thanks for listening.